A belated welcome to Craig Russell to our blog! 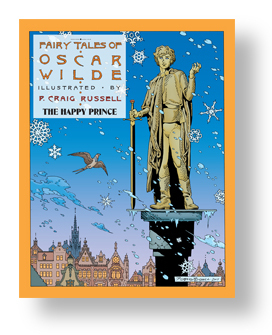 We’ve got a series of fascinating videos/interviews of him working specifically on his next Fairy Tales of Oscar Wilde, the 5th volume with the Happy Prince, coming out in April and to be premiered at MoCCA in NY end of April. We’ll post one a week of those and also have him comment in regular blog entries on his work. The book is being solicited for now at comics stores. We’re also busy at the office working on putting together the book to go out to the printer tomorrow. The artwork is stunning and Lovern Kindzierski’s colors just beautiful! Lovin’ every minute.